Home › Distractions › Sign here for your phone, dear. Sign here for your phone, dear. My teenage daughter was up for an upgrade on her phone and like every other kid in her class, she wanted the iPhone. Why not, right? It cost the same as the other phones in the store and she had the new contract. 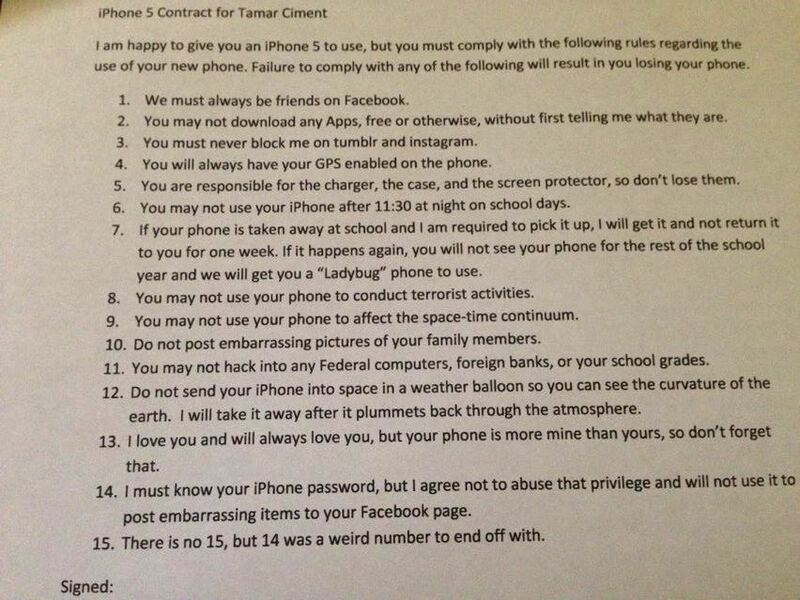 So taking a cue from this lady, I wrote up my own iPhone contract for my 15 year old daughter. Here it is: Yes, I took some ideas from the original writer, but I think with kids, especially 15 year olds, humor tends to be more effective than lecture. For the record, she didn’t want to sign it at first and was happy to not have a phone. I was fine with that as well. She gave in after two days.